NCSimul Machine simulation and optimization software from Spring Technologies is reported to help aerospace and other manufacturers create “digital twin” process models. Graphic courtesy of Spring Technologies. BOSTON, Mass.— Aerospace industry analysts say aircraft production will continue to grow for two decades or more; the worldwide civil aviation fleet alone is expected to double. To meet the continual ramp-up in aircraft output, OEMs and subcontractors alike are employing leading-edge machine tools, tooling, and CAM software in the Internet of Things (IoT) / Industry 4.0 environment. A key element of the Industry 4.0 domain is creation of electronic “digital twin” models of product data and production processes. The virtual models correspond with the physical shop floor processes and allow manufacturing operations to be simulated, tested, and altered to avert possible problems and downtime, while also facilitating process optimization. Such cyber-physical systems bridge the gap between the real and virtual worlds. NCSimul Machine simulation and optimization software from Spring Technologies is reported to help aerospace and other manufacturers create “digital twin” process models that facilitate fulfilment of customer demands for higher production rates and unwavering product quality. NCSimul Machine software works directly with ISO NC machining codes to simulate, verify, and optimize machining programs based on specific parts, tooling, and machine tool characteristics. Three-dimensional graphics help prevent crashes while complex algorithms and embedded process-based knowledge enable optimization of cutting conditions. Use of the NCSimul Machine software is said to reduce time spent debugging programs, eliminate risk of spindle collision, tool breakage and scrap, and improve cycle times, process efficiencies, and machine utilization. 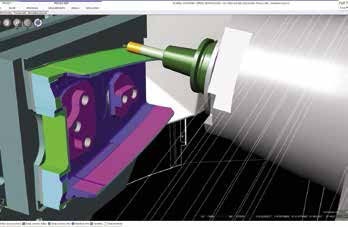 The software provides machining verification in three steps. It investigates and corrects coding errors; it simulates to detect collisions and corrects motion errors; and it validates the machining results. The software also monitors production transfers, tool management, and machine status. Overall, use of NCSimul software can help manufacturers meet delivery schedules, maintain aerospace-level product quality, and reduce preparation times up to 70 percent while cutting costs by 20 percent, Spring Technologies said in a release. “NCSimul Machine enables manufacturers to increase the flexibility, speed, and profitability of their operations by achieving complete and integrated mastery of Industry 4.0 manufacturing processes,” said Silvère Proisy, Spring Technologies North American operations manager. Spring Technologies is part of Hexagon, a global provider of information technology that aims to drive productivity and quality in geospatial and industrial enterprise applications. PreviousWill Manufacturers Establish Servitization Strategies in 2019?